Meanwhile, The New York Times writer Alan Schwarz has a story this past weekend about the SOHS program. He notes that Stanford is now attaching its name to the high school on a more official level… It is now called Stanford Online High School rather than the Experimental Program for Gifted Youth. 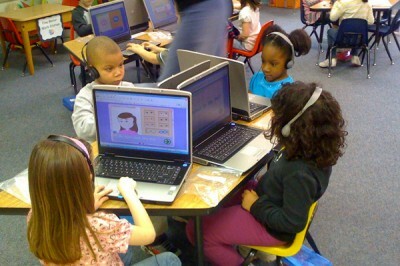 Some education experts, Schwarz notes, consider that a milestone for online education. As the line between virtual and classroom-based learning continues to blur, some see Stanford’s move as a sign that so, too, will the line between secondary and higher education. Several other universities — though none with the pedigree of Stanford — already operate online high schools, a development that has raised some questions about expertise and motives. 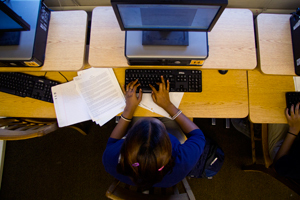 About 275,000 students nationwide are enrolled full time in online schools, according to Susan Patrick, president of the International Association for K-12 Online Learning, a nonprofit advocacy group. Most of these are free public charter schools, but colleges — private and public — have begun to get into the business as well. The University of Nebraska, Lincoln, and the University of Missouri have awarded diplomas to about 250 and 85 students, respectively, annually for the last several years. The George Washington University Online High School opened in January. Capitalizing on its reputation in foreign language instruction, Middlebury College in Vermont last year worked with K12, a for-profit company, to develop online high school language courses serving 50,000 students nationwide. An individual student’s course costs $749 per year, and Middlebury will share the profits. Ronald Liebowitz, Middlebury’s president, said that while “it looks like mission creep beyond belief,” the opportunity to raise revenue carried the decision. In this growing market, Stanford Online High School aims to be the destination for the most talented students. About 20 percent of the current 120 students receive financial aid to offset the $14,800 tuition, which is about half the average private-school tuition nationwide but far more than the University of Nebraska program’s $2,500. About 300 more students take one or more $3,200-per-year classes to supplement a bricks-and-mortar program. Of the high school’s 75 graduates, 69 so far have enrolled directly in four-year colleges, according to Raymond Ravaglia, the high school’s executive director. Eight attend Stanford, and 25 others are at Ivy League institutions or other elite campuses. In a typical class session, about 14 students simultaneously watch a live-streamed lecture, with video clips, diagrams and other animations to enliven the lesson. Instead of raising hands, students click into a queue when they have questions or comments; teachers call on them by choosing their audio stream, to be heard by all. An instant-messaging window allows for constant discussion among the students who, in conventional settings, might be chastised for talking in class. But Mr. Etchemendy, the provost, said he “would be neither upset nor shocked” if enrollment at Stanford Online High eventually approached that of Stanford’s undergraduate population, about 6,500.